Tucson is located on the Santa Cruz River, along Interstate 10. Tucson was settled in the 1700s. While Phoenix was the state government and agriculture seat in the early periods, Tucson was a commercial area. Tucson covers a large area and has many neighborhoods. The downtown area has grown over the years and is currently being revitalized. The University of Arizona is in Tucson and employs many in the city. Davis-Monthan Air Force Base is located on the southeast edge of the city. Tucson also has many tourist attractions with accompanying restaurants, hotels, and resorts. It is an area for "snowbirds," residents who come for the mild winter. One of the winter attractions is the Tucson Gem and Mineral Show, held each February. Tucson also has art and historical museums as well as performing arts venues. • Arizona - Find travel information, maps, tourist resources, and more photos of Arizona. 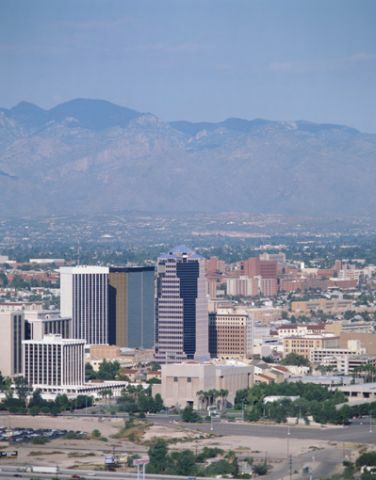 • City of Tucson, Arizona - Visit the official Tucson, Arizona government website. • Tucson Convention & Visitors Bureau - Visit the official Metropolitan Tucson travel and tourism website. • Tucson Guide - Business directory and maps of Tucson, Arizona.